The days are getting shorter, the year is drawing to a close. Many new CDs from known and previously unknown artists have found their way into my mailbox, live concerts made me excited or impatient to wait for the final encore. This makes it interesting to write reviews. I deal with a variety of musical styles, I like some, others I don't. The goal is to remain objective, and yet exhibit my personal opinion. Probably, the Buskers Festival in Bern has influenced me most in 2013 and reinvented folk music for me. The old songs, dances and tunes did not originate in a recording studio, but on the street, in the pub or at home in the living room. They were not executed in concert halls, but for friends, played at parties or on the street in the hope to earn something for a living. An uncle of my mother had to supplement his agricultural income in wintertime by playing the accordion to dance to. Today street musicians do exactly the same. In the summertime these festivals grow like mushrooms, for Christmas time they will come back and try to be a part in the big business. 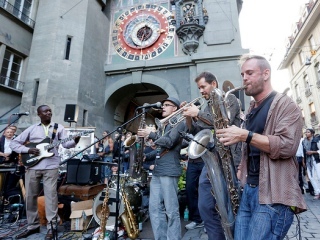 Whether they play traditional, contemporary or original music, their art is supposed to entertain the people in the streets, to correspond with the zeitgeist and please. The Argentinian Che Sudaka, Mute Fish from Ireland, the Swiss folk musicians of SULP and many other artists have begun in the streets and fill concert halls nowadays. The modern media enable the worldwide distribution of music that originated in the street for the people, and the global wanderlust of the artists make cultural boundaries disappear and new world music evolve. That's my thing exactly!